Canada is the second largest country in the world. It is a collection of ten fairly large provinces and three territories. The total area of Canada is 9,984,670 square kilometers. Initially Canada was a colony of the United Kingdom but today it is a free nation. The National Flag of Canada holds a large red maple leaf in the middle with thick red borders on the two sides. Canada represents Federal Constitutional Monarchy with Parliamentary democracy. Toronto is the largest city of the country. The capital is Ottawa. The official languages of the country are English and French. Much of the land in Canada is either under water or consists of rocky, marshy, mountainous, which is just not fit for settling down. This is precisely why most of the inhabitants settle in areas that have better soils and is easier to live in than the rough terrains. The climate of Canada varies from temperate in the southern region to sub arctic and arctic in northern region. In fact, Canada’s climate is influenced by latitude and topography. The north of Canada has harsh Arctic and sub-Arctic climates, which is why it is sparsely inhabited. 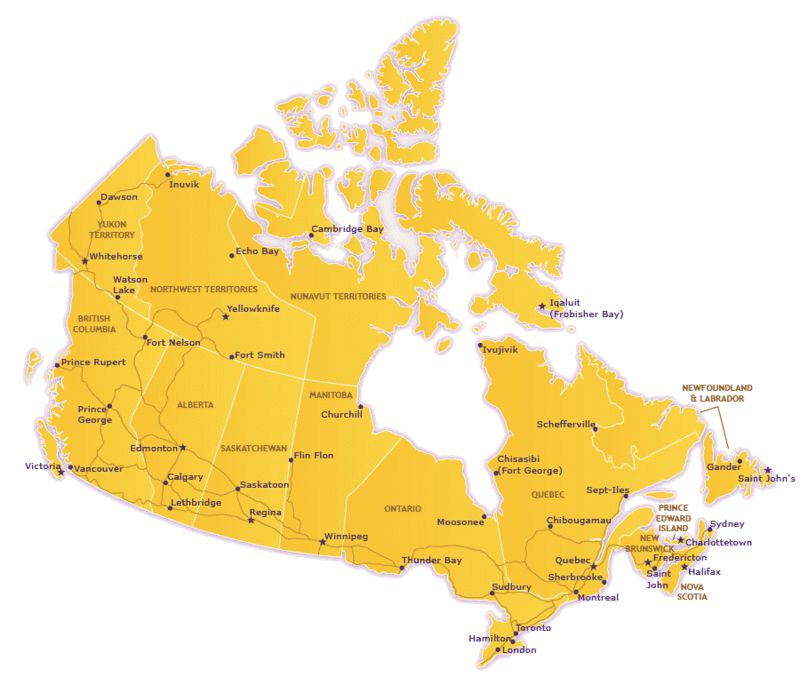 Most Canadians live in the southern part of the country. Canada is one of the richest countries of the world and it is also one of the leading producers of several minerals. The total population of the country is 32,878,900, according to the 2007 census. Major part of this population is concentrated around the Great Lakes and the Saint Lawrence River. Incidentally Canada has the largest number of lakes in the world, hence an important accumulation of the world’s fresh water. Canada offers grand scenic beauty.